It is likely no secret if you've been reading this blog for awhile now (or just know me in person really well) that I love bags. I'm a crazy bag lady. It's like being a crazy cat lady, but instead of a million cats, I have a million bags. (Side note, I am a crazy cat lady too with my two furry girls at home, but that's another subject.) Bags just make me happy the way shoes or makeup make other people happy. I like changing up my bag quite a bit. Recently though, I have stumbled on to what just might be the holy grail of bags for me and I haven't really changed up what I've been carrying now much at all in the last several weeks - that's a pretty big deal for me! I was talking with a friend who used to sell Stella and Dot and she was getting rid of some samples she no longer wanted. 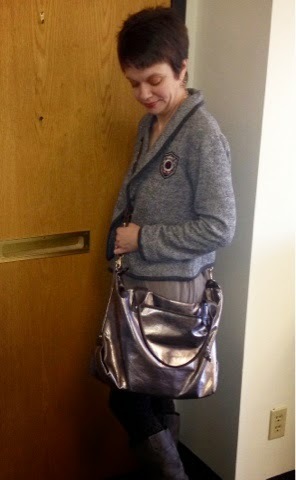 She is not a bag lady and offered me the How Does She Do It bag in pewter because she knew I was a bag fan. I wasn't about to say no, so I took her up on it. And then I got it home and was like...hmm. This is a LOT bigger than what I usually carry. So it sat in my closet for a bit. Then I finally said, ok, I'm bored with my usual bags, let's give this a try. Oh my god. What was I waiting for?? First of all, it can be made SMALLER. 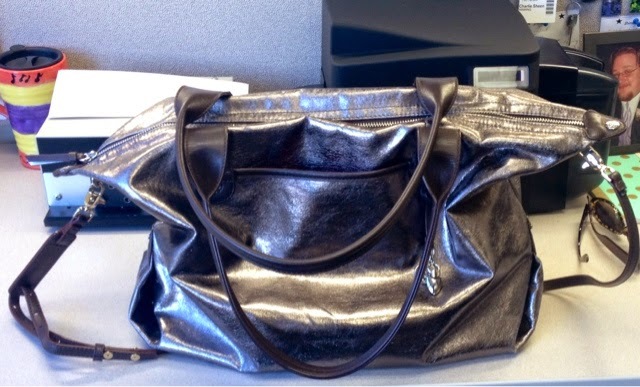 All you need to do is flip down the two sides and it become a great sized hobo, over the shoulder bag. See? Isn't that cute? I also absolutely love that it has this large pocket on the front outside of the bag - this is the best slot for my cell phone and work badge to slide into. Now, I did take a quick picture of it expanded so you can see that too - there are some instances that I have actually liked having it be bigger, especially because I found out there was a crossbody strap that could be added and was able to order one through my new Stella and Dot enabler - Sara from Writing With Bangles. It looks really cute when you wear it crossbody - makes it nice and hands free for shopping/chasing after my child/etc. But I also still like making it smaller and wearing it over the shoulder as well. 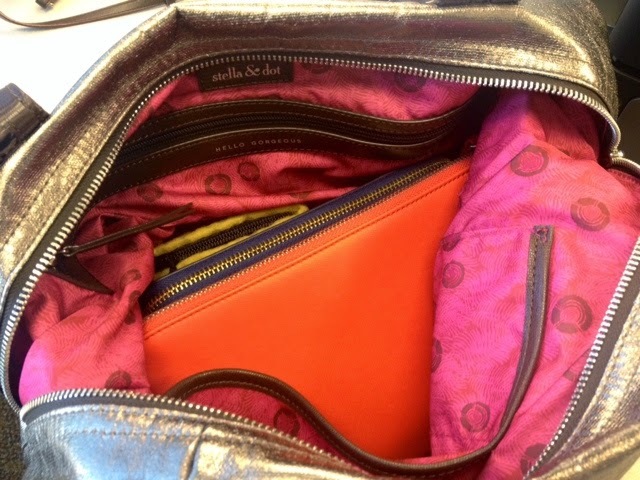 And the inside is just too fun - I love purses that have fun colored insides, this one is pink and how cute is that little message by the zipper pocket that says "Hello Gorgeous"? It also has two slip pockets on the side. Lots of room. Even snapped into it's smaller silhouette it has tons of room inside, I don't even think I could fill this up all the way! 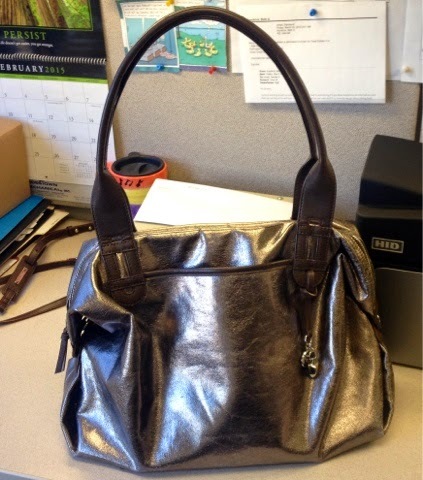 The most surprising thing about this bag to me is, it's actually relatively lightweight. I'd expect it to be super heavy, but it only gets that way if I have added a bunch of Ollie's stuff. I think it would also probably weigh more if I added my laptop, which is supposedly supposed to fit, but I have a different bag for that. So anyway, I have hardly stopped carrying this bad boy since I pulled it out of my closet in January. I'm even starting to get rid of other bags that just don't add up - and that's huge! Now I did decide to host a catalog party with a friend who sells Thirty One and some of their new purses have the potential to rival this one for me, so I guess we'll see what happens, but for now, this bag is pretty much the new love of my life and I just had to share. Do you have a favorite bag? Or are you more of a shoe/something else fan?